T-Mobile will be the first major mobile carrier to sell the LG Stylo 4, an informant told TmoNews. The release of the device is scheduled for Friday, July 13th, which matches the date set for the "Launch software" update on the company's support page for the device. As for the price, it's expected to be $250, or a $10 down payment and $10 per month for two years. This device has two stand out features that might be considered a selling point for some: Its large 6.2-inch screen and the stylus. 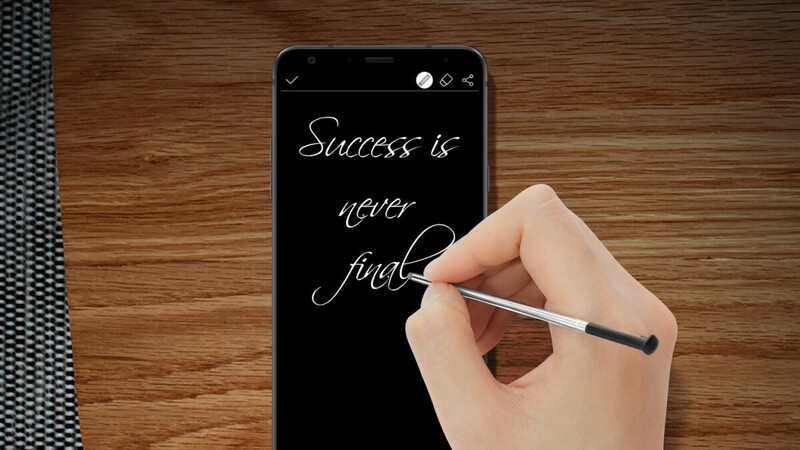 To make better use of the stylus, LG has added software that lets you do some cool things like writing notes on the screen while it's turned off. Other than that, the insides aren't thrilling, a Snapdragon 450 chip is doing all the work paired with 2GB of RAM, which might be insufficient for a device meant for productivity. Another drawback is the 3300mAh battery. While not a small capacity per se, combined with the phone's big display, it may lead to shorter battery life than users might be looking for. At that price point, the cameras won't amaze you either, it has a 13MP main camera and a 5MP front facing one. There are a few pleasant surprises on the spec sheet though: the Stylo 4 has NFC, a feature missing on some similarly priced devices, 600MHz LTE Band support, and comes with Android 8.1 straight out of the box. If you love using a stylus and the Galaxy Note 8 is way out of your price range, this might be the phone for you. I dunno. My Moto G5 Plus only has 2 GB RAM and I multitask just fine. Maybe it's the SD625? Only 2GB RAM for $250? What a ripoff! MetroPCS has the same phone for $70 with a port-over ($30 phone + $30 plan + $10 activation fee). Never buy phones from TMobile! No Plus versions? It has less ram than Cricket's version. If it has one more gb of ram......I will get it. The LG Stylo 4 is in a good spot in LG's lineup. Great features for the price! It looks like we'll see overlap with the LG Q7 Stylus models, and also, the snapdragon 450 is "pin compatible" with the newer series of 600's, so the 4th gen stylo plus has room to move. TM/Metro Stylo 4 - SD450/2GB, 32GB, 13MP/5MP Cricket Stylo 4 - SD450/3GB, 32GB, No NFC, No QC, 13MP/5M Stylus Q7 Alpha - (MT6750S/SD450)/3GB, 32GB, 13MP/5MP Stylus Q7- (MT6750S/SD450)/3GB, 32GB, 16MP.8MP Stylus Q7 Plus- (MT6750S/SD450)/4GB, 64GB, 16MP.8MP The base Metro/TM Stylo 4 is only missing LTE Band 14,25,26,29,30 in the US. TM - 2,4,12,66,71 AT&T - 2,4,5,12 Verizon - 2,4,13 (LTE Only compatible?) Sprint - 41 If the Sprint/TM merger goes thru and Verizon allows BYOD, this phone may be a hidden gem in LTE simfree devices. With CDMA being phased-out, this may be your last 4G LTE phone before the 5G models are released.